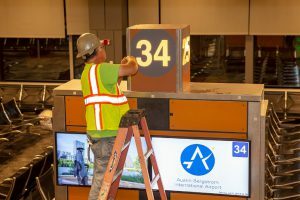 This month, Austin-Bergstrom International Airport (ABIA) began offering service to a brand new nine-gate expansion, generally referred to as the East Terminal expansion. Not surprisingly, the new area is at the east end of the Barbara Jordan terminal. The new gates, including six capable of handling international flights, will boost the airport’s capacity from 11 million passengers a year to 15 million. The expansion will also be home to a new Delta Sky Club and have 29,000 square feet of retail space and amenities such as an outdoor, shaded terrace for watching planes take off and land, and additional restrooms, including a private pet relief/restroom. The east terminal expansion is part of the Barbara Jordan Terminal, which means that it will be accessed via the regular methods of transportation. Park&Zoom will still offer the zoomiest parking and shuttle service available, with all their stellar services and amenities, like wide, covered spaces, car care services, and friendly staff. 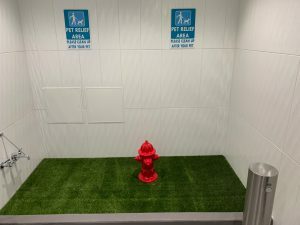 For those of you travelling with a pet, the new pet restroom will have a pet relief stall with simulated grass and a fire hydrant. It is set in a curbed area with a hose, along with a handwashing sink and a special drinking fountain in the room. 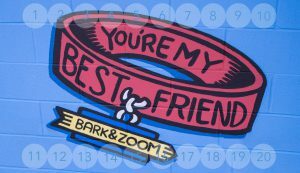 Crystal Dunn, Facility Director of the Bark&Zoom Pet Hotel, notes “The simulated grass has flow-through backing to provide an anti-microbial environment for the safety of your animals.” But if you decide you want to leave your pet in Austin, don’t forget to check out Bark&Zoom, which offers parking and a pet hotel for dogs and cats! The first phase of the opening of the east expansion will only use the north facing gates. Construction will continue on the individual concessions and restaurants planned for the terminal. 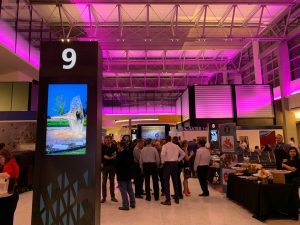 But, there will be temporary storefronts for gifts, travel essentials, coffee and grab & go items available during this second construction phase.